A six metre tall soldier containing 5.000 poppies on the tower at Belton Church to mark the end of World War I 100 years. 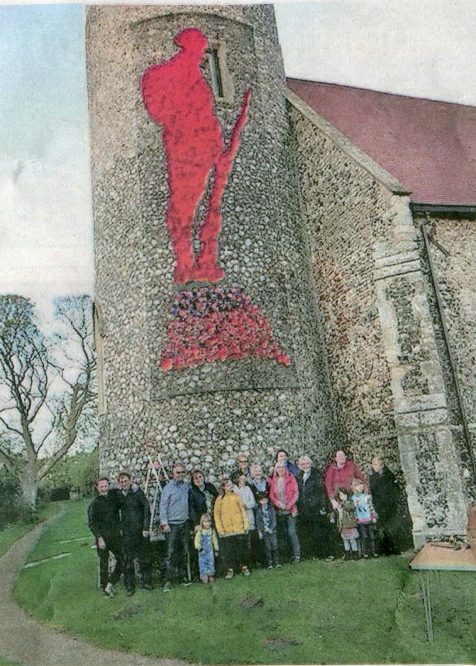 All saints Church in Belton with Browston has created a six metre tall soldier on the side of the tower to mark the centenary of the Armistice in November 1918. Reverent Rosie Bunn, rector of All Saints said: “we only began the poppy tribute 2 months ago, I was away on holiday for my son’s wedding and read an article about tributes for the Centenary and thought we could do that”. “Its so amazing to see finally the finished product and to see people coming from far and wide to view it.” Most of the poppies are made of wool and felt and recycled plastic bottles from members of the Belton Scout Group. The finished Soldier on the Tower of Belton All Saints Church.